In the first game since the trade announcements have been made, the Chicago Blackhawks faced off against league leaders the Washington Capitals. With new addition Tomas Fleischmann, traded from the Montreal Canadiens, and Hawks returnee Andrew Ladd both playing in the clash, they really helped to show that GM Stan Bowman does know exactly what is best for his team, and how to add even more strength to his roster for this season. 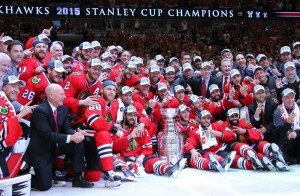 The Blackhawks are well on their way to becoming Stanley Cup Champions for the second time in as many years, with Bowman strengthening his team in such a way. Ladd has already proven himself to be a good choice for the Hawks in the trades as he had a hand in captain Jonathan Toews’ power play goal, earning him his first point in his first game back in Chicago since 2010. Fleischmann has also made a great first impression for the home fans as his front of the net presence gave the visiting Capitals something to worry about. game, Teuvo Teravainen had some great chances to get on the scoreboard. Although he maybe hasn’t had the best record in terms of scoring, he certainly has had his opportunities and very much remains a threat to the opposition. Hawks coach Joel Quennville has been putting together some rather dangerous line combinations, each one offering something different in levels of skill, power and speed. One such line has been the grouping of Patrick Kane, Artemi Panarin and Artem Anisimov. On their own, each player has something to offer: Kane with his enviable stick and puck handling skills; Panarin with his speed and quick shots; and Anisimov with his ability to read the game and be in the right place and the right time. 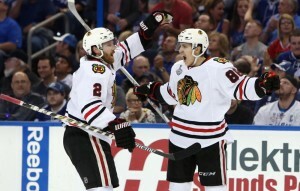 Together, they have contributed to the Blackhawks with an impressive 176 total points. With the latest additions to the Blackhawks roster over the past few days during the trade window, they have only made themselves stronger. The Blackhawks have proved that they will, yet again, be contenders for the Stanley Cup in June.